Round 8 fully lived up to its expectations. 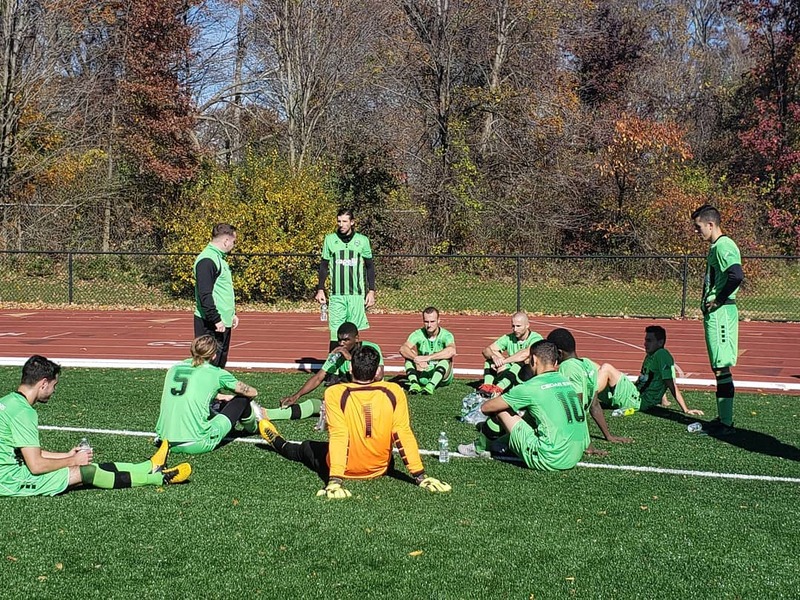 Cedar Stars Academy’s matchup versus NY Pancyprian Freedoms was one of the most awaited game of the Fall season; the long awaiting period wasn’t in vain as the two clubs displayed the match of the season so far, in which the Freedoms conquered CSA, 4-3. Zum Schneider F.C. 03’s Cinderella winning-run ended as they fell to powerhouse NY Greek Americans, 3-1. Lansdowne Yonkers F.C. rallied back to a 4-4-0 record after blanking NY Athletic Club, 1-0. Doxa downed Hoboken F.C. 1912, 2-1, while Shamrocks moved back to the winning column with a 4-2 win over Central Park Rangers Whites. NY Pancyprian Freedoms broke Cedar Stars Academy’s perfect start of the season of 10 straight victories, edging them, 4-3, on Sunday morning at Ramapo College Athletic Center. Cedar Stars opened the scoring in the third minute when Bledi Bardic steered Christopher Katona’s diagonal pass in the net from the top of the six-yard box. The Freedoms players knew they were in for a tough game then. It didn’t take too long for the Cypriot club to level the scoring as they did so in the 13th minute when Adam Himeno controlled John-Brown’s through ball on a counter attack before hitting a shot to the far right corner. Pancyprians took the lead in the 22nd minute as John-Brown side-footed Himeno’s cross in the net. The Freedoms scored a third unanswered goal in the 65th minute when a CSA defender knocked a Himeno's left winged cross in his own net. Bardic pulled it back 3-2 with his second of the night and 14th goal of the season as he headed Dilly Duka’s pass to the near corner of the net in the 69th minute. NY Pancyprians went up by two again in the 77th minute. After Bryan Lopez saved his shot on a breakway, Himeno passed the rebound back to John-Brown, who one-timed a shot in the net from the box. Katona made it 4-3 for the Stars in the 85th minute as he chipped the ball in the net after taking on three Pancyprian players in midfield. CSA had two crucial opportunities to tie it up later on. One in which Jonathan Borrajo headed Katona’s header off the goal line in the 88th minute. NY Greek Americans ended bottom side Zum Schneider F.C. 03’s game-winning streak, overpowering them, 3-1, on Sunday evening at Randall’s Island Field 75. Former Houston Dynamo midfielder Joe Holland opened the scoring with his first goal for the club in his debut-game in the 30th minute. Tyler Botte extended the Greeks' lead to 2-0 in the 65th minute from John Sabal’s feed. ZSFC cut NYGA’s lead in half later in the second half. Saad Afif found Junior Cabrera on the wing, who cut in past two defenders before squeezing a shot in the near corner. NYGA re-established their two-goal lead in the 80th minute when Adam Marcu led Holland on goal. Lansdowne Yonkers F.C. defeated NY Athletic Club, 1-0, on Sunday afternoon away from home at Travers Island. Dawda Bah netted the game-winning goal in the second half, heading Jack Doherty’s corner kick to the top right corner of the net. The Bhoys lift their record to 4-4-0, which places them in fifth spot while NYAC drops to a 2-3-3 record and to sixth place. 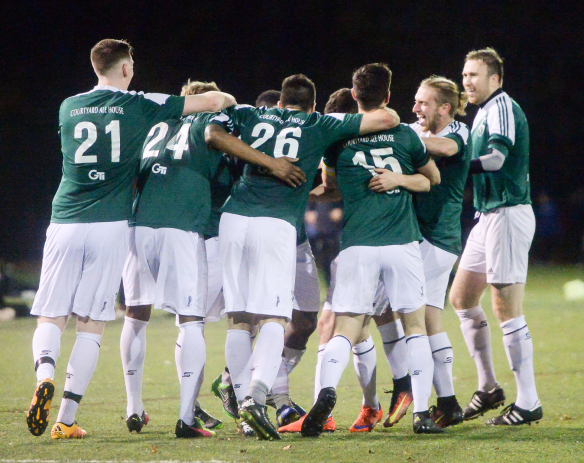 Shamrocks enjoyed a 4-2 victory over Central Park Rangers Whites on Saturday night at Randall’s Island Field 70. Alejandro Fritz, Kurt Cameron, Mark Roche and Dan Giorgi were on the scoresheet for the Rocks. As for CPR, James Greco hit a magnificent shot to the top corner halfway in the first half to make it 2-1. Later in the 70th minute, Kevin Kretschmer pulled it back, 3-2, when he accidently lobbed the ball over the keeper in a broken play. Doxa S.C. broke a four league-game winless run by overpowering Hoboken F.C. 1912, 2-1, on Sunday night at Randall’s Island Field 74. Stefanos Hondrakis scored the opener for Doxa in the 15th minute from Dominick Falanga’s pass. It was Hondrakis' second goal in two consecutive matches. 10 minutes later Falanga sent Joseph Sanchez on goal. Falanga is now the team's top assitman with three goal-passes. Kevin Halliday pulled one back for Hoboken in the 88th minute. Doxa was unfortunate not to score more than two goals as they hit the post five times.